Demanding markets require innovative solutions. Meier excels in providing complex critical-to-function and micro-sized components required to meet the needs of today’s advanced technologies. From concept to production, we understand the materials and the manufacturing processes needed to best deliver your product. Meier takes into account all of your design requirements from close tolerance stamping to Electric Discharge Machining. Whether custom design or current product blueprint, our team is ready to create a scalable manufacturable unit for you. Our extensive knowledge in high-performance material alloys and tempers combined with our experience fabricating stamped metal-formed components provide a proven resource for your most challenging applications. Our product designers work closely with your engineers to produce valuable Design for Manufacturability (DFM) input. With these Six Sigma-like processes, we employ tools like Tooling Failure Mode Effects Analysis (TFMEA) and Process Failure Mode Effects Analysis (PFMEA). These operations ensure that we have examined design integrity in all possible outcomes, so that critical-to-mission units adhere to production specifications. Using the latest CAD software, Meier’s expert engineers convert design from traditional formats by using advanced prototyping techniques to produce viable and precise stamping prototypes. From larger stamped parts to Meier’s unique understanding of stamped microparts, we work with a dedicated focus on how our manufacturing stampings interact with other critical-to-mission components and functions. Our validation expertise and requirements give us an advantageous perspective with which to identify and address manufacturing capability risks before we even cut the steel. This allows us to deliver the best value while achieving your quality, design and performance objectives. All of our design competencies lead to high-quality, production-ready stamping tools. We meet your expectations using the full capabilities of our tools. Meier’s lessons learned in prototyping are utilized in production tool design and development in producing highly reliable critical-to-mission products. Rooted in our tradition as a tooling design and manufacturing leader, Meier’s advanced in-house tooling team is equipped with modern CAD technology to produce the high-quality dies and fixtures used in our precision stamping and assembly operations. Using this advanced 3D solid-modeling CAD software, our highly-skilled design team uses years of experience to create high-quality progressive and automated transfer dies necessary to transform a simple metal strip into a complex finished component. We perform complicated processes, including punching, coining and bending a large variety of unique metals, to produce the most efficient solution. Working with the latest CNC machining centers, CNC wire EDM, grinding and high-speed milling technologies, Meier’s dedicated toolmakers convert the tool design into an automated production die. Our experience allows us to mitigate issues of quality control, high-volume application and material research that have been barriers to profitable stamping operations. In addition, our tool evaluations eliminate the traditional clearance difficulties that other stamping manufacturers face when integrating close proximity features. Once the automated production die is ready, it undergoes rigorous de-bug and testing procedures to guarantee the component produced meets your dimensional and performance requirements. Our qualification and validation procedures, designed to demonstrate capability and repeatability, assure that once the tool is transitioned to manufacturing, it will produce high-quality components for the life of your product. Meier has optimized the time-consuming process of quality testing. Our typical system includes feasibility analysis for the requisite materials. We also test at the stamping line to create custom process settings that become part of a comprehensive plan. 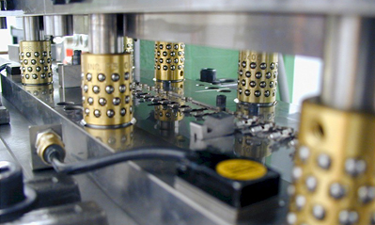 From the beginning of the finite element simulation to experimental testing, Meier knows that developing stamping dies can take weeks and be the most expensive aspect of the development process, so we adhere to the tooling and development schedule for all our precision tooling projects, even at high levels of complexity. The results are dies that are extremely robust, retain their consistency, and exceed typical die life expectancy. Well-executed project management is key to ensuring the successful outcome of every project, whether it is for a quick turn prototype or the design and validation of a Class A production tool. Meier’s project managers use a formal process to make sure every program is well structured and closely monitored for on-time and on-budget performance. However, a project is more than just a plan; it requires the right resources to turn the plan into action. With an eye toward lean project manufacturing, our designers, engineers, and quality and manufacturing personnel know what it takes to deliver high-quality stamped metal components. Every project requires a defined set of carefully orchestrated activities and resources. At the initiation of every project, a project manager will work with your team to define the project deliverables, expectations and tasks necessary to meet the required outcome. We will develop a detailed plan linking tasks, resources and responsibilities with a timeline outlining critical milestones. Through continuous monitoring and review, the project manager will anticipate issues that could impact the project, thus eliminating missed deadlines and surprises that can derail a timeline. Meier Tool brings a suite of established project management methodologies to each unique challenge. Our seasoned teams have a solid grasp of our operational model and react to developments with more flexibility and oversight into risks. Meier brings innovative solutions to every manufacturing stamping project while staying on budget and ensuring a quality product. The only aspect of Meier that may be more dynamic than our manufacturing protocols are our project managers. They anticipate roadblocks and work to steer your team toward the most viable options. Throughout the project, a project manager will provide frequent and accurate communication to your team via email, phone or conference calls as requested. More importantly, each member of your team will have a dedicated go-to professional to answer your questions, update your project status and help you stay on target. From start to finish, your project will be handled efficiently with a focus on budget, and uncompromising quality, while clear, concise information will guide your team to and project toward your goals. The DFM is a review and discussion of your designs and tolerances to ensure that products can be manufactured at a reasonable cost. The review also guarantees that a stable manufacturing process is feasible and meets your quality requirements. As capabilities rapidly increase, the DFM model allows us to quickly adapt cutting-edge engineering and stamping protocols, providing the most up-to-date manufacturing techniques that cut end-product discrepancies. This detail-focused DFM review, creates an end product that is also well positioned for Design for Assembly (DFA) and the overarching Design for Inspection approach. This is a critical phase of any project to make sure that the tooling is capable and robust enough to meet the demands and rigors of manufacturing. 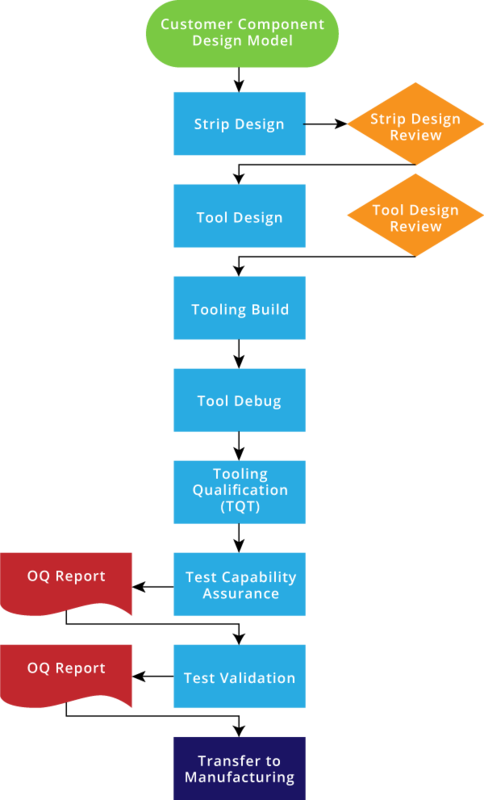 Using a variety of standard techniques like FAI, Product Part Approval Process (PPAP), or a full validation OQ and PQ required by our medical device customers, our Tool Qualification Process (TQT) assures that your parts will be consistent from run to run and will maintain the high-quality that you expect throughout the product lifecycle. Throughout the subtractive manufacturing process these evaluations provide the best possible quality within the high-tolerance requirements on a feature-by-feature basis. As part of our culture of continuous improvement, every project undergoes an objective and critical review against the planned timeline, resources, budget and any other issues that may have impacted the plan. These “lessons learned” provide Meier with an important and valuable opportunity to apply our experience and take any necessary measures to enhance and improve our planning and performance on future projects.